Analysis of the gases resulting from the thermal degradation of a sample (eg polymer) to propose reaction schemes for degradation of material. Reaction Understanding : In situ reaction monitoring enables the tracking of concentration changes of key reactive and transient species to understand mechanism pathway, determine kinetics and detect major reaction events for real-time process optimization. 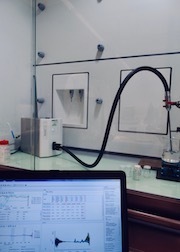 The manager of the Vibrational Spectroscopies facilities participates in different research projects, developps analytical methods and carries out analytical services to both public and private research centre.